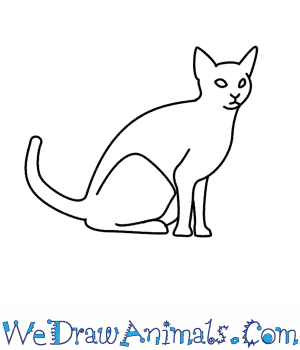 In this quick tutorial you'll learn how to draw a Cat in 5 easy steps - great for kids and novice artists. At the bottom you can read some interesting facts about the Cat. Step 1: Start with the head. Think of a backward "C". 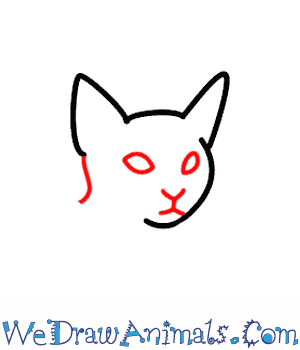 Step 2: Starting at the top of the backward "C" draw a pointy ear. From the bottom of the ear continue a short curved line to make the top of the head. At the end of this line add another pointy ear a bit bigger than the first ear. Step 3: Now add two oval shaped eyes. One is right at the bottom of the first ear and the other is just below the curved line for the head. The nose and curved mouth at below the two eyes at the bottom of the face. Step 4: From the bottom of the second ear draw the curved back line. 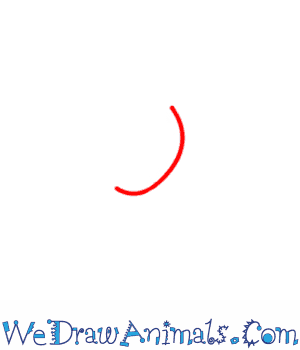 It will curve downward. The neck line starts at the bottom of the mouth and curves down to become the front leg. The front line of the front leg is straight down to the paw. The back of the leg comes straight back up and curves slightly up back toward the head. Step 5: The hind leg is a big curve that begins at the end of the back. It curves up and around over to touch the front leg and continues the curve back almost to the back line. This is the top part of the leg and looks like a crooked "U". The back foot is leg is very long. 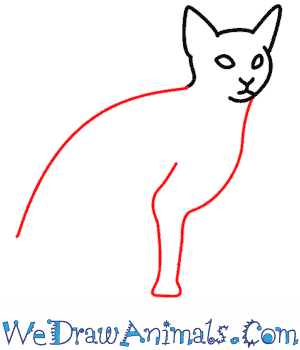 It starts just below the end of the back line and goes flat along the bottom almost touching the front paw. Now add another front leg directly in front of the first front leg. 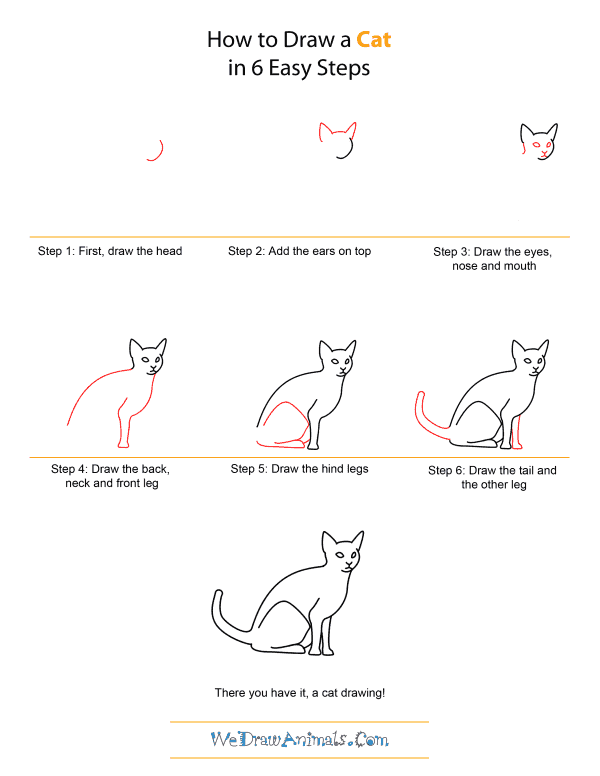 Finish your cat with a long, thick tail. The two lines of the tail start from the bottom of the back line and the back line of the back foot. The tail is about half the length of the body. A male cat is known as a tom, and a female cat is either called a molly or a queen. Cats are said to have 9 lives because they can get themselves out of sticky situations. Their flexible bodies, amazing reflexes, and strong senses help them avoid danger. Almost all cats can land on their feet because of their flexibility and reflexes. Cats really only have one life, which lasts up to about 15 years. Cats have little spikes on their tongues used for cleaning themselves. They lick their fur, using their tongues like hairbrushes. Cats can groom for hours, which is how they choke on fur balls. Cats live everywhere except Antarctica. They can be found in a variety of habitats including wetlands, deserts, coastal regions, and forests. Cats, especially those kept as pets, like to prey on birds. Domesticated cats like to chase and play with objects like balls of yarn. It is their way to “practice” hunting and catching their prey. 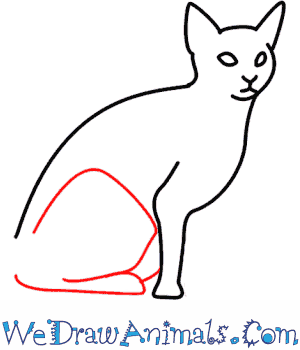 To appear bigger, cats arch their backs, stiffen their legs, and puff the fir on their back and tail. They do this when they are afraid and want to scare away predators such as aggressive dogs.